On Friday, I went to the funeral of Arlene—a woman I never had the pleasure of personally meeting in this life, but knew of because of my friend: her daughter, Carol. I’ve been to many viewings and funerals, but this one was filled with more joy than almost any I’ve experienced. (Another one was for my friend, Bill, who was one of the coolest people I ever met!) I know that part of the jubilance was because Arlene lived for 96 years. I know, too, that her family was grateful that she was no longer in pain. But, being in that room—where those who love her had the chance to say their earthly goodbyes—I learned much about her, and the reasons for the celebration of her life. 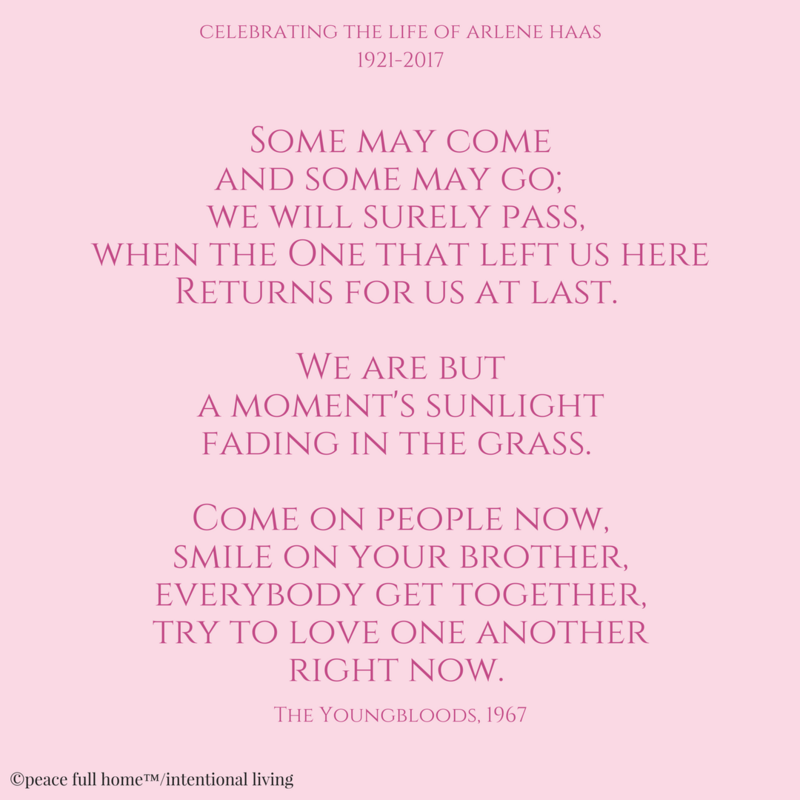 Arlene was an amazing, loving, beautiful human. The eulogies given by three of her grandchildren were funny, poignant and touching, and offered testimony to how she lived. The minister, who led the service, told me that she’s presided over many funerals for people who have lived in the senior community she pastors, but that, today, she was also burying a friend. The luncheon, after we left the cemetery, was also filled with love and joy. It was a rich experience, that offered me even more insight into what a life well-lived looks like—a life where it wasn’t a sacrifice to help, or lift-up, or be there for others—a life lived with intention. We often forget to remember to live with intention. We get so caught up in the things of this world—material possessions, rushing from place to place, being consumed by media, achieving financial wealth, creating a magazine-worthy house, getting drunk on electronics, building the perfect career—that what truly matters at the end of the day (or year or life) hasn’t been acknowledged, valued, respected or honored. Living with intention requires stepping back to step forward. It calls us to reevaluate what we’re doing with our lives (I mean this literally), and choose how we spend the time we have left (whether that’s 50 minutes or 50 years). So, what would it look like to name, and then own, what you want to do with your life? Tomorrow, I’m going to get up at __________after sleeping for__________hours. The first thing I’ll do after getting out of bed is_________________________. I’m going to choose to spend time with these people:_________________________. I’m going to invest__________hours doing:_________________________. I’m setting aside some quiet time to____________________even if it’s only for__________minutes. Then, at night, before I go to sleep, I’m going to_________________________. There are no wrong answers and, depending on the season of your life, the blanks will hold different words. If you work—inside or outside your home—you may have a large chunk of your hours taken up in a way that you wouldn’t necessarily choose to spend them but need to, in order to earn money to live, or take care of others you’re responsible for. If that’s the case (as it is for most of us), you have to be even more intentional about how you spend the rest of your hours. The key to starting the intentional process is to be truthful with yourself, as you set your intention for the next day. 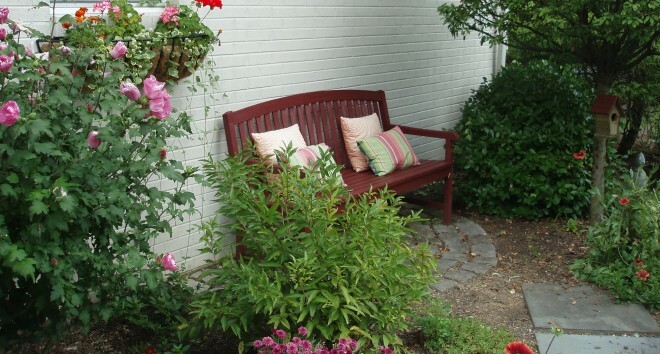 Arlene may never have thought about “intentional living”, but she did it naturally. Nkosi came into this world with a short expiration date already imprinted on his tiny body. Both made impacts in their own ways, and both practiced intentional living. What wonderful role models. post script: If you would like a word document that you can print out, and use each night to “Fill in the Blanks”, just email me and I’ll send it to you. This entry was posted in Living Intentionally, Peace Full Home and tagged honesty, importance, intention, time management, truth. Bookmark the permalink.